All these cameras are new, use 35mm film and come with instructions in English. IMPORTANT: See below for warranty information. Also available English translation of the Fed stereo repair manual (covers all models). Also see the section on modifying the Fed Stereo for full frame. Bulb setting of F2.8 for long exposures. Manual and flash settings available at 1/30 of a second F2.8 up to F16. 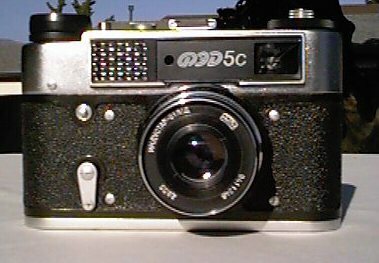 The Fed stereo cameras take a pleasing stereo pair in 7P European format (24 x 30mm). It has automatic exposure for carefree shooting. Outlet for manual cable release. Includes manual, camera strap and battery. Includes case and instructions in English. Step into the past with this snazzy retro camera which has Leica features and sturdy construction. It has the added bonus of having a hot shoe. According to our research this was originally made as a spy camera but at over two pounds this camera is anything but compact. It is a good camera to use for those who want more control than current point and shoot cameras offer. Built-in light meter (selenium cell). 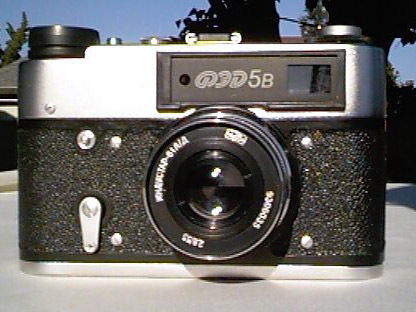 Same as the Fed 5C with adjustable diapter eyepiece. 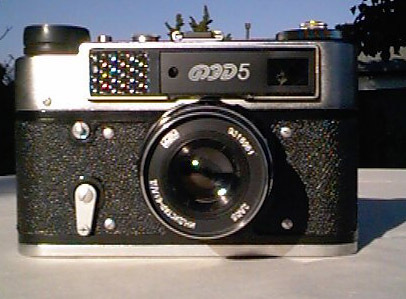 Same as the Fed 5C but without any light meter. Warranty Note: We give a 30 day exchange or money back warranty on all the cameras on this page. Please run a test roll (or two) as soon as possible and inform us of any problems. If there are problems within the first 30 days we will exchange or repair the camera or refund your money. Availability Issues: Due to economic conditions in the Ukraine we cannot guarantee the availability of the cameras. We will try to keep this page as up to date as possible.